Home/DIYs/HID vs LED for Cars – Which is Better? Both are great options with much better looks, so which one do you pick? I have a number of posts on my blog about upgrading your existing halogen bulbs to either HID (Xenon) bulbs for headlights or fog lights, as well as a number of articles on upgrading to LED bulbs for smaller things like DRLs, Reverse Bulbs, and City Lights. A commenter recently asked why I recommend HID vs LED setups depending on the bulb, which is a great question! 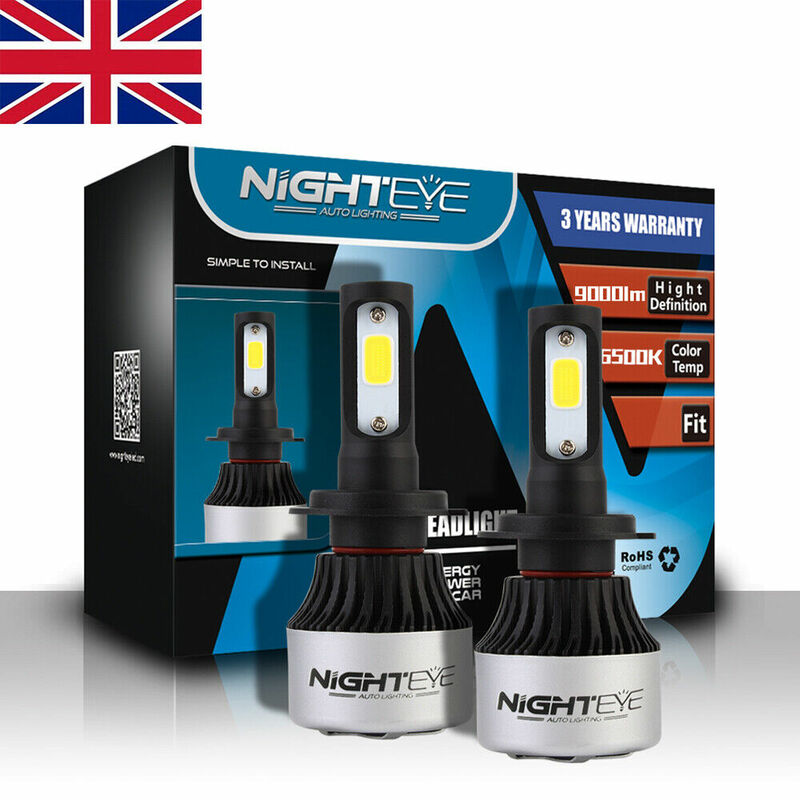 Both LED and HID headlights have gained popularity in recent years because they offer the appeal of advance technology and high performance, as compared to traditional halogen bulbs. Whereas halogen bulbs more closely resemble the type of household bulbs that you would have at home, both LED and HID headlights use sophisticated technology to light your path. Both are good options for your vehicle, but there are some differences bear noting when choosing between the two. Let’s look at LED vs HID headlights and compare the two options throughout the rest of this post to understand when one option is better than the other. Also known as xenon headlights, HID (or high intensity charge bulbs) feature an arc of electricity created by electricity travelling between two tungsten electrodes inside the bulb, which is filled with xenon gas. The result is a brighter light than you get from a tungsten element alone. To put that into perspective, you can get about 3,000 lumens (a unit measuring the amount of light emitted per second) from an HID bulb, whereas a halogen bulb emits just about half that amount, for a difference of 90 square meters vs. 30 square meters of illumination. That results in better night driving visibility and increased safety, even in bad weather. HID bulbs also use much less energy than halogen bulbs and last much longer than halogen bulbs – 2000 hours of illumination as opposed to just 450. On the downside, HID lights are rather expensive when compared to other types of lights and because they are uniquely shaped, it can be difficult to retrofit an older car with these bulbs. LED bulbs are relatively new on the automotive lighting scene, but they have gained huge popularity in recent years. LEDs are electrical conductors that emit light when they are turned on by way of an electrical circuit. The circuit is either switched on or it is off; these bulbs do not require a heating up period. One of the biggest advantages in favor of LED headlights is that they have very few parts. That means they can be made quite small and can withstand any vibrations and bumps that may occur on rough roads. They, too, consume less energy than halogen bulbs and are very long-lasting, sometimes up to tens of thousands of hours. One of the most popular reasons for choosing LED bulbs is that they come in many different colors of light. I was recently encouraged by a blog reader to reconsider my stance on LEDs as a main headlight beam…LEDs have come a long way since I originally wrote this, and more and more options are on the market making LEDs worth reconsidering for your high or low beam headlight bulbs. I picked up a kit on Amazon for roughly $32 that had great reviews, so I went for it. My previous opinion was that LEDs didn’t work well for high/low headlight beams because they didn’t throw light far enough…but like I said, the technology has come a long way since the cheapo LED bulbs of the past, and manufacturers are now specifically designing LED bulbs intended to be used for the high/low beam bulbs for your car. The LEDs I picked up for my wife’s Ford Focus have built in fans to keep them cool, making them a lot larger than the halogen bulbs that came with the car. Despite the added size, they fit inside the housings just fine, although I had to poke some holes in the dust boots so they don’t overheat. After driving around with them for a little bit, they don’t seem to be getting too hot to be concerned although you can hear the fans running which is a little unusual at first. There is no need for a ballast like HIDs which is nice, they just plug into the OEM wiring and you’re good to go. Install is a breeze, and the color is very similar to HIDs giving you that same european/luxury look. I knew they’d look good in the housing (like all LEDs do), but I was happy that the light output was great too. My wife’s Ford Focus doesn’t have projector beams, but despite that the light still travels pretty well with a decent enough cut-off not to blind anyone. I think HIDs still throw the light just a bit further (especially with a good projector lens), but I think the LEDs throw light just as far as the halogens and also illuminate that field of vision better, so net-net it’s a huge upgrade from your OEM halogen bulbs. When to Pick HID over LED? LEDs are cheaper, smaller, don’t need a special ballast or projector lens, and have more color options, which makes them the ideal choice for replacing smaller bulbs like turn signals, reverse lights, or reverse lights…but for lights that you need a longer field of vision, like your headlights, fog lights, or a separate spot light (i.e. on a roof or separate light rail) it’s a closer race. The price of LED bulbs versus HID kits is about the same now, making price no longer a concern. If you want something simple, the LED kit needs no external ballasts and can be plug & play – so keep it simple. The HID kits are still my preference for high/low beam if you have a projector lens to focus the super intense light of HIDs, but without the projector lens I’d recommend going with LED bulbs instead. What LED or HID Kit to Buy? Both LED and HID kits are about the same price, around $30-40 on Amazon with free Prime shipping. There are more expensive kits out there for both LED and HID, but I’ve used both kits at the $30 price range and never had issues. My preferred brands are XENTEC for HID and LASFIT for LED. You can find (affiliate) links to these kits below, simply select the right bulb size you need (whatever the OEM bulb is that you’re replacing) and select the color for the HID (4,300K is stock, anything higher is more blue in color – I like 6,000). TL;DR – LEDs are great for nearly any bulb. Stick with HIDs if your car has a projector lens to focus the intense light of HIDs, choose LEDs if you’re upgrading from halogens and don’t have a projector lens. What bubls did you buy for the day time lights? My car is using HID bulbs for headlights and fog lights, but using halogen bulbs for turn signals. I guess I should replace turn signals with LED bulbs. Thanks for your valuable information! For me, me LEDs on my S3 look cheap and not as expensive. I feel like they look like a common Kia coming down the road. I don’t know if that is because I am so use to HID or Xenons being the “luxury” look or not. But, that is just my opinion. They are much “whiter”, but feel cheaper–even though there is an uncharge for that package. Any thoughts? They’ve definitely become a lot more common these days, but I still prefer the look to the yellowish halogen bulbs. I haven’t had any luck doing LEDs in the turn signal bulbs on my car, the Audi/VW system is really finicky about those for some reason…but worth a shot, just not sure what resistors to advise. do the HIDs get hot like household halogens do? I would think that would have some sort of effect long term? Right now where I live the regulations are very harsh about HID lights so my default is go for LED lights… but I like the pros and cons comparison you made, very illustrative. In my fog lights….I thought the yellow or orange like light color would be better for fog or snow. Bright white lights does not do well in Foggy weather, in my driving experience. That is why my head lights does not work as well as my fog lights. Thanks for the article, Nick. A little silly but, you really would go HID for headlights (since it sounds like you feel like look more … expensive and have a longer view distance)? And maybe LEDs for fog lamps? – We just bought a Mini convertible for my wife. Thinking about installing HIDs in my ’10 genesis coupe. Because of the beam difference, is the projector something that can be bought and given to the person installing the lights or what is that about…I know halogen bulbs normally have their own housing, so how much will HIDs affect that? I’d go HIDs for headlights definitely. For fog lights I’d probably still go HID – the LEDs don’t really project the light a very far distance, they’re better suited for DRLs, turn signals, etc…unless you get an aftermarket housing and LED that is high powered and meant for fog light use, of course. Hi Evan – interesting, thanks for the info! Let me know how it goes on the B6, I’m curious if they through a headlight error in the dash or not. Recently i also saw D1S Led replacements instead of the OEM Headlights. I will test them next week! I hope quality is good and they will survive quite some time. Are the LED bulbs supposed to have HID ballasts wired up to them? I would think not, but check with the manufacturer. hi nick roshon bmw e34 headlight are a little bit dim , what is your suggestion for a better vision , xenons or led ? I’d go xenons, better light range…but I’ve heard LED bulbs have come a long way, so if you really wanna try it out, go for it. You really should revisit this blog. I’ve installed LED low beams and fog lights on my wife’s 05 Acura MDX. OMG the light output is amazing. I’ve also installed H11 led fog lights on my 12 A4 6000k. They match my HID headlights and led driving lights perfectly. Hi Jason, got some pictures you can provide? A little more info? I’d be happy to update this post…you are right that a lot has changed since I originally wrote it. I have not tried LEDs in high or low beam myself yet. Hi Ryan – assuming you have halogen bulbs currently, the main challenge is that your factory headlight housings do not have a projector to focus the light discharge of a LED or HID, so either way it will likely blind oncoming traffic / look like you have your brights on all of the time. If I had to choose, I’d stick with HID for the main bulb (high/low beams) and LED for everything else. Nick, all you need to do is google it. Your car uses the H7 bulb type https://www.amazon.com/gp/aw/s/ref=is_s_ss_i_2_7?k=h7+led+headlight+kit&sprefix=h7+led+&crid=K53J28SQROID you can easily use a plug and play led kit for way less than the prices you quoted. I’m assuming the prices by the OP are mostly installation quotes, and he’s quoting those costs because he doesn’t want to DIY, but yes, easy to get either cheaper. I’ve read up on a bunch of reviews on LED in main bulb and still cannot recommend them, the beam does not throw nearly as far and seems like a safety hazard…especially if you don’t have housing thats are intended to use LED bulbs. To each their own. Nick, I’ll be more than happy to send you some information. Maybe this weekend when I’ll have mote free time. Also the above post was meant for Ryan, sorry for the confusion. You also brought up a great point on the reflector housing. I auto assume (my bad) that 99% of newer cars uses projectors now. Nick, i decided on Lasfit brand. I purchased H11 for my fog lights in the B8 A4 and my wife’s 05 MDX (low beams). I also purchased the fog light bulbs for her MDX after she expressed so much love for her nee low beams. Search YouTube for (lasfit led headlight). Tons of information available. One other thing is to make sure of the bulb position in the housing. You may need to buy adjustable led if the headlight housing offsets your bulb 45° a standard non adjustable is fine otherwise. Cool – I just picked up the same brand, was also cheapest on Amazon. The bulbs look straight on the car, should be fine. Stay tuned! Hey Nick, how’d the LED’s work out? Hey Jason – finally got them installed and updated the post – check it out! Fantastic update Nick, thank you for updating the article. I do like LEDs better. I don’t think they look cheaper, in fact I think they make the car look better at night. Yeah I think both LEDs and HIDs make the car look substantially better. Hi nick, i have a ttrs 8j and i would like to know if i can fit the main light bulb hid (d1s) by some led bulb d1s, if possible? thank you! I’m not sure you can put a LED bulb in a HID setup, the HIDs have ballasts that might not play nicely.